In 1963, twenty-five-year-old Hunter S. Thompson completed a yearlong journey across South America, filing a series of dispatches for an upstart paper called the National Observer. It was here, on the front lines of the Cold War, that this then-unknown reporter began making a name for himself. The Hunter S. Thompson who would become America's iconic "gonzo journalist" was born in the streets of Rio, the mountains of Peru, and the black market outposts of Colombia. In The Footloose American, Brian Kevin traverses the continent with Thompson's ghost as his guide, offering a ground-level exploration of twenty-first-century South American culture, politics, and ecology. 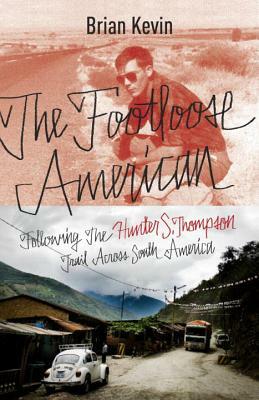 By contrasting the author's own thrilling, transformative experiences along the Hunter S. Thompson Trail with those that Thompson describes in his letters and lost Observer stories, The Footloose American is at once a gripping personal journey and a thought-provoking study of culture and place. BRIAN KEVIN has written about travel, adventure, and culture for Outside, Sierra, Men’s Journal, and Travel + Leisure. He received a 2010 Lowell Thomas Award from the Society of American Travel Writers. He currently lives in coastal Maine where he's a contributing editor at Down East.